The National Museum or Museum Nasional or locally known as Museum Gajah (The Elephant Museum) located on Jl Medan Merdeka Barat No 12 Jakarta Pusat/Central Jakarta. The name of Elephatn Museum a bronze statue of elephant gift from King Chulalongkorn (Rama V) which is right in front of the Museum. Dutch East Indies government on 24 April 1778 establishing a community called Bataviaasch Genootschap van Kunsten en Wetenschappen (BG) as an independent body which aims to advance research in the arts and sciences in particular in the fields of biology, physics, archeology, literature, ethnology and history, and publishes the results of research. The institute has the slogan “Ten Nutte van het Algemeen” (for the Public Interest). One of the founders of this institution, the JCM Radermacher, donated his house in Jl. Kalibesar, a commercial area in Jakarta Kota. In addition to donating the house, he also donated a collection of cultural objects and a very useful book which led to the founding of the museum and library. During the period of British rule in Java (1811-1816), Lieutenant-Governor Sir Thomas Stamford Raffles became Director of this Society. Raffles ordered the construction of a new building for use as a museum and meeting rooms for the Literary Society (formerly called the building “Societeit de Harmonie”). The building is located in the Majapahit No. 3. Now it stands at the State secretariat building complex, near the presidential palace. 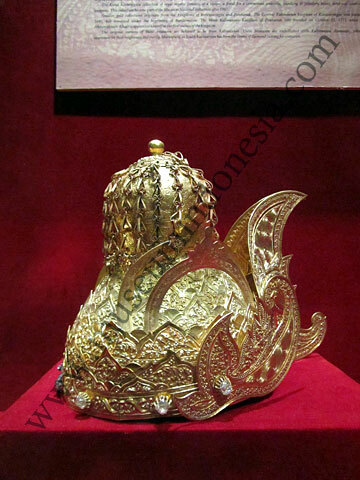 Total collections are continues to grow so the museum at Jalan Majapahit can no longer accommodate the collection. In 1862, the Dutch East Indies government decided to build a new museum building at its current location, which is Jalan Medan Merdeka Barat No.. 12 (used to be called Koningsplein West). The land covers an area that later, it was built the building of the Recht Hogeschool or “Law School” (now Ministry of Defence). This new museum building opened to the public in 1868. National Museum opened to visitors from Tuesday – Sunday from 08.00 and closes at 16.00 on Saturday and Sunday a special Museum closes at 17.00 on Saturday and Sunday. National Museum is closed to the public every Monday and National Holidays / Religious. The National Museum provides a gift shop in the form of books, postcards, and other fabrics after a visit to the exhibition halls, as well as snacks and beverages release thirst. The shops are open during the days and hours visit the museum. Previous Post More Fair Price, Please?